alaTest on kerännyt ja analysoinut 1066 arvostelut tuotteelle GoPro HD Motorsports HERO Set. Keskimääräinen antama arvosana tälle tuotteelle on 4.2/5, verrattuna keskimääräiseen arvosanaan 4.0/5 kategoriassa Videokamerat. Me analysoimme käyttäjien ja ammattilaisten antamia arvosteluita, tuotteen ikää ja muita seikkoja. Verraten muihin tuotteisiin kategoriassa Videokamerat, GoPro HD Motorsports HERO Set on saanut alaScore™-arvosanan 86/100 = Erittäin hyvä. The lack of a viewfinder makes precise aiming difficult. The tiny LCD display and a cryptic menu is difficult to navigate without first consulting the manual. Low-light performance still leaves much to be desired. The GoPro HD Hero captures crisp HD video and offers users a great deal of flexibility of resolution and mounting options. However, some users may find it to be too complex for its two-button interface and tiny screen. GoPro Motorsports HD Hero has a great video and photograph quality. There are lots of mounting options and is shock proof and waterproof. Buy it if you don't mind the tiny screen and the two button interface. 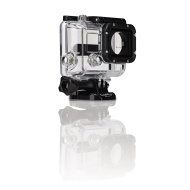 The Motorsports Hero is a waterproof mini wireless digital video camera for motorsports. Its quick-release design simplifies click-mounting the camera to your car, motorcycle, helmet, etc. Developed at the track, the Motorsports Hero shoots TV resolution 30 fps video with sound tuned to capture the grunt, squeal, and stoke of driving at the limit. Records video to a SD card (not included).